When Navy SEAL Adam Brown woke up on March 17, 2010, he didnt know he would die that night in the Hindu Kush Mountains of Afghanistanbut he was ready: In a letter to his children, not meant to be seen unless the worst happened, he wrote, "Im not afraid of anything that might happen to me on this earth, because I know no matter what, nothing can take my spirit from me." But after high school, Adam fell in with the wrong crowd, and his family watched as his appetite for risk dragged him into a downward spiral that eventually landed him in jail. Battling his inner demons on a last-chance road to redemption, Adam had one goal: to become the best of the besta U.S. Navy SEAL. Fearless is the story of a man of extremes, whose courage and determination was fueled by faith, family, and the love of a woman. Its about a man who waged a war against his own worst impulses and persevered to reach the top tier of the U.S. military. Always the first to volunteer for the most dangerous assignments, Adams final act of bravery led to the ultimate sacrifice. ERIC BLEHM is the best-selling author of The Only Thing Worth DyingFor, which recounts the harrowing story of the first Special Forces A-team to infiltrate Taliban-held southern Afghanistan weeks after 9/11. It was a New York Times and Wall Street Journal bestseller. The Last Season, winner of the National Outdoor Book Award, was named by Outside magazine as one of the ten "greatest adventure biographies ever written." Blehm lives in California with his wife and children. "As a rule, we dont endorse books or movies or anything regarding the command where I workand Adam Brown workedbut as the author writes in Fearless, you have to know the rules, so you know when to bend or break them. This is one of those times. Read this book. Period. It succeeds where all the others have failed." "Adam Browns zest for life led him down a few dark alleys and more than one dead end. Kind-hearted and wild, Adam led a life that lacked direction. God, a woman, and the U.S. Navy gave it to him. Fearless is a love story...several love stories: a man for his woman, a warrior for his team, parents for kids, and soldiers for their country. There is no greater love than that a man lay down his life for his friends. Be warnedreading Fearless will change the way you see the world." "When people know they are going to die, often their one regret is that they didnt say I love you enough. Adam Brown never had to worry. His life was about love: love of God, family, friends, country, his fellow SEALs, and the Afghan children who worshipped him. In his latest book, Fearless, Eric Blehm does a marvelous and moving job uncovering the manthe menbeneath the SEAL mythology of elite, rock-hard warriors, renowned for their courage and skill. The SEALs in Fearless hug their children, seek comfort from their wives, wear Batman briefs, answer to names like Big Bird and Fozzy, mourn lost buddies, and risk their lives to rescue civilians from the field of fire. This is a stirring, revelatory, heartbreaking story." "This is not another SEAL book about ego; this is a powerful book about perseverance that will absolutely inspire everybody. Adam was a warrior in the truest sensecourageous, compassionate, intrepid, and humble. And his dedication to God, country, family, and the Brotherhood was genuine and exceptional. This book will motivate you to challenge yourself to be&hellip;fearless." "There is a quote from the Bible etched onto the memorial that stands in the shadow of World Trade Center steel that resembles a massive trident: Then I heard the voice of the Lord saying, Whom shall I send? And who will go for us? And I said, "Here am I. Send me! " That was Adam Brown. Fearless is a clear and deeply honest portrait of an authentic American man who lived and loved with an intrepid personal velocity. For most of us, the failures and disappointments in life take their toll. Not for Adam Brown. He vanquished all lifes heartbreaks with faith, humility, and hard work. His commitment to his family and his friends helped forge Adam Brown into the rarest of warriors. Long live the Brotherhood." 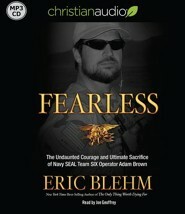 "Fearless stands unique among works of modern combat literature through author Eric Blehms masterful weaving of a fallen Navy SEALs professional war-fighting life with his complex personal victories and travails. Rich in detail and captivating in its honesty, you wont put Fearless down once you read the first page. 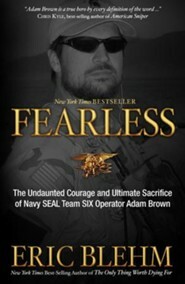 Read it and prepare to learn a whole new world of life as a Navy SEAL." 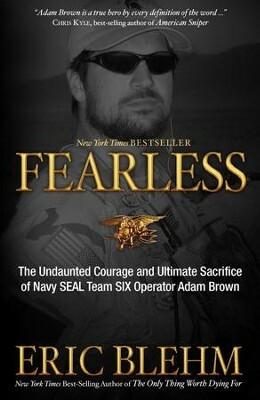 "Fearless is a vivid account of one man's journey from all-American boy to all-American hero. Blehm's writing takes you beyond the battlefield and right to the heart of the personal battles, sacrifices, and triumphs of one of America's elite warriors. Anyone looking for an inspiring story of inner strength and courage will be richly rewarded by this book." "Be prepared for the full range of emotions as the true adventures of a real American hero demonstrate that 'with God, all things are possible.'" 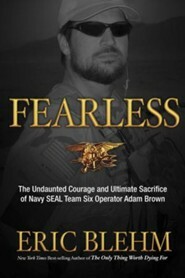 I'm the author/artist and I want to review Fearless: The Undaunted Courage and Ultimate Sacrifice of Navy SEAL Team Six Operator Adam Brown.